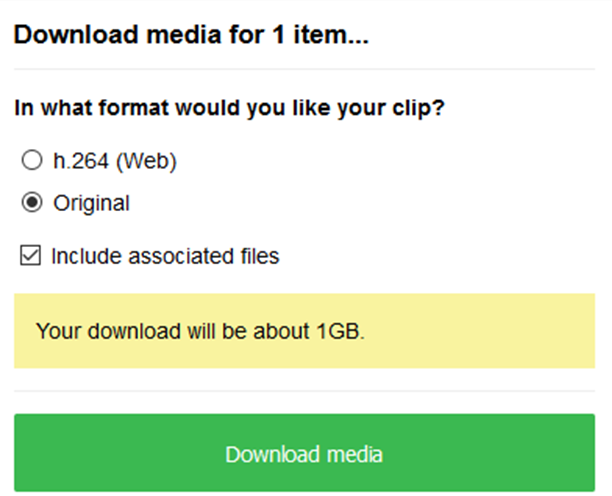 We have various tools you can use to download your media from Aframe, covering smaller singular files to the more data heavy clips and complex folder structures. For downloading smaller singular files, you simply select the clips and choose the download icon. 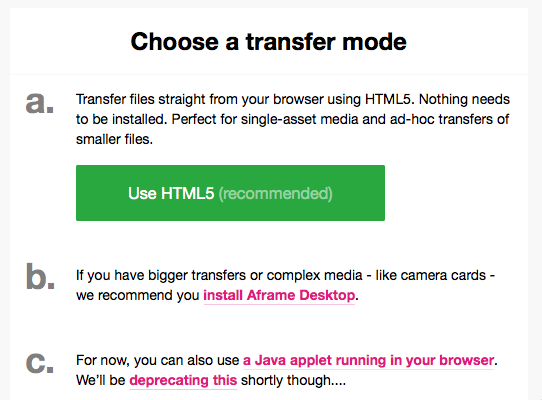 Option a is the HTML5 downloader, great for singular assets, requiring no plugin or installation and should work on pretty much most networks. This mode uses your browser speed, so may be slower than our other options. Move to option b or option c for accelerated downloads or folder structures. The original is as it says, the original file that was uploaded. Selecting option a will then then take you through to screen much like the one below, which lists the files you selected, simply select each one to download that clip. 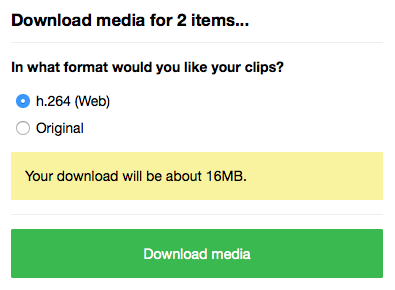 If you only select one clip, it will automatically download. If you require a faster mode please click on &apos;**Change mode**&apos;, at the bottom of this screen. 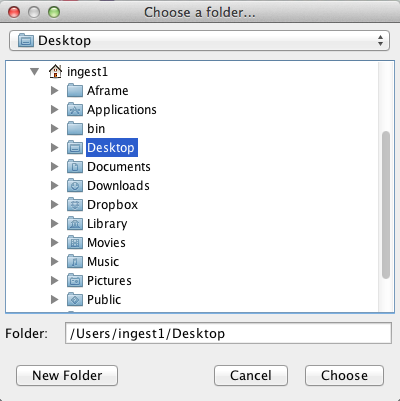 Option b is Aframe&apos;s desktop application, which is best for larger files and folder structures as you have different modes to accelerate your transfer. You set up a connection between a collection on the project and your machine/drive, Aframe then watches and downloads any new media available. Follow the link above check out how to install and make use of all its features. Option c is the Java web applet, which requires the latest version of Java to be installed on your machine. This tool is also able to download folder structures and has accelerated transfer modes available. When you select media that was part of a card/folder or has associated metadata, you will see an extra option &apos;include associated files&apos; (as shown below). Either check it or uncheck, depending on what you need. Once you select download, the applet to launch a dialogue window where it will ask where you&apos;d like to store your media. Select a location, or create a new folder, and hit &apos;Choose&apos;. Immediate download of your media via your chosen transfer mode will commence. Should your transfer fail for whatever reason, just choose to download again, to the same location and the download will resume at the last point. Downloading via option b & c will retain any folder structure presented at upload, so it&apos;s possible to pull down cards in their entirety, ready for use in the edit. If you experience any issues with the Java applet (option c), please check out this support article for help on Mac or this support article for Windows. We are also available 24/7 via our chat or contact us on 02072064186.